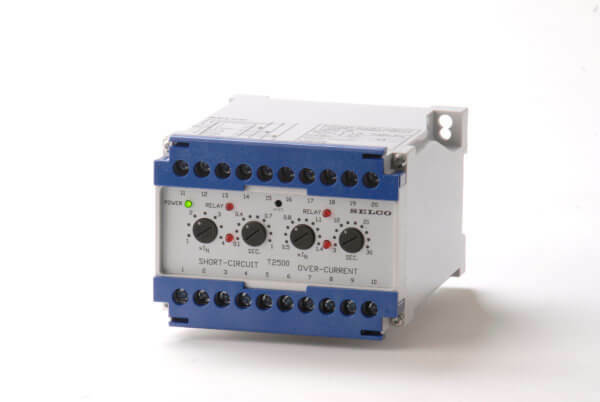 The combined T2500 3 Phase Overcurrent and Short Circuit Relay is intended as a protection relay for generators, power transmissions and consumer’s supply by tripping the main circuit breaker. The short circuit relay protects against faults causing high currents and the overcurrent relay protects against thermal damage. The SELCO T2500 is a high quality Over-Current and Short-Circuit relay intended for protection against thermal damage and faults caused by excessive currents. The T2500 can be used to protect generators, power transmission lines and various types of consumer supplies. The T2500 monitors two levels of current and trips the circuit breaker when one of these two levels has been exceeded continuously for a time period (defined by an adjustable delay). The T2500 will support the connection of up to three phases, but will react on the largest of these three measurements. The current measurements are done through external current transformers (CTs) – typically with a secondary current of 5A. The Over-Current function can be adjusted to trip within the range of 0.5 to 1.4 x I (input current). The delay of the Over-Current function can be set between 3 to 30 seconds. The Short-Circuit function operates within the range of 1.0 to 4.0 x I. The Short-Circuit delay can be set between 0.1 and 1 second. The T2500 will react on the highest of the three input currents. The Pick-up LED will ignite as soon as the level is exceeded, while the relay is activated only after the delay has passed.